Velvet curtains can definitely give an aura of elegance and opulence wherever they are placed. More than just having the practical use of ensuring privacy, these curtains can also function in insulating the temperature in the room, thereby making them a handy room accessory during the cold weather. If you are the kind of person who do not appreciate the glaring sunlight, then having these curtains would be extremely beneficial for you. They can also produce the same sound-proofing effects that carpets can provide in the area. Technically, it would be quite impossible to eavesdrop in a room with layers of velvet draperies for security. In addition, they are quite capable of blocking out dust, dirt and other harmful microorganisms that might be coming from the outside. 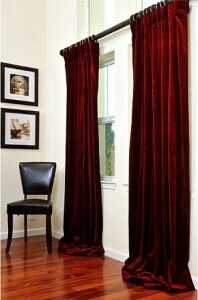 Velvet window curtains have also made an impact in bringing back the grand Victorian atmosphere into modern-day houses. Therefore, you can be assured that you can elicit some sense of coziness and warmth whenever you take a glance at the direction of your window. They can evoke many thought such as harmony, softness, sophistication, and even sensuality, especially if you are using black velvet drapes. Surely, your guests will be enthralled with your wise usage of curtain to beautify your room. However, using these fabulous curtains also has some minor drawbacks. Among these is the hefty price tag that comes with them. Of course, you would not expect anything grand to come cheaply, would you? Another problem that may pose a threat to your health is too much accumulation of dust and dirt, particularly when they are not kept or maintained properly. This may appear as just something trivial, but the amount of dry cleaning that you will need might cost you a lot if you bring them to a professional laundry shop. To avoid this hassle, then you should be dedicated in vacuuming them once in a while. Rest assured though that despite some downsides, these curtains can show you beauty and artistry at its finest. PreviousWhy Choose uPVC for French Doors?